Usually retail compilations of PSN or XBLA titles are very bare-boned affairs. A few don’t even have a main menu in place, instead simply plonking their contents into your game library. When thatgamecompany is involved with something though, nothing is ever ‘usual’. Retailing at £15 – give or take a quid or two – Journey Collector’s Edition brings together the celebrated Journey, the equally beautiful Flower and early PS3 curio flOw, along with a generous amount of extras. Even those who have played all three before will find the 30 minute developer commentaries for each title informative, plus there’s also the option to download exclusive themes and avatars, as well as export the whimsical soundtracks to your music library. A trio of bonus mini-games have been included for good measure too, all of which were originally entries to 24 hour GameJam coding competitions. Understandably they’re on the basic side, but they aren’t without merit. Duke Wars is the best of the bunch – a single-screen RTS of sorts with some amusing speech-samples. Gravediggers is another single-screen effort, with the idea being to collect the heads of zombies and return them to a crypt. Likewise, the sound-samples for this one raise a grin. This leaves us with the amusingly named Nostril Shot, which sees a blue-haired anime-style female gunning down waves of 2D enemies. Journey is the star of the show, of course. Simple yet engaging; minimalistic yet beautiful. This passage of life and death lasts only around two hours, but is renowned for leaving a lasting impression on all those who play it. We could go into great detail about the sights and types of puzzles you’ll encounter while travelling towards a beacon of light in the distance, but we don’t want to spoil a single thing about it. The real beauty of Journey is experiencing it for yourself first-hand. What we will say though is that we wished more developers would seamlessly blend online functions into their games. 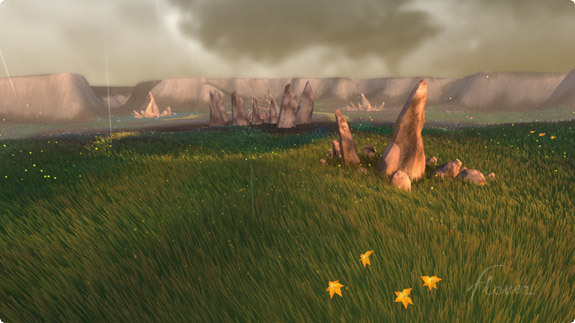 As you make embark on your journey other players come and go, with their names not revealed right until after the credits. We actually thought we were joined by only one other player, but it wasn’t until the end that we learned we encountered many more than that. It really is quite an outstanding game, full of ‘out of the box’ ideas skilfully implemented. The same thing can be said about Flower, a game that defies all categorisation. There are plenty of words that we can use to describe it though, including both ‘beautiful’ and ‘innovative’. There’s no punishment or restrictions – you’re simply free to follow the breeze, transforming the varied landscapes as you go by brushing past unopened flowers. When all have been found an exit opens up. Connecting several flowers in a row in without having to turn around is very satisfying, much like completing a route in NiGHTS into Dreams without missing any collectables. The SIXAXIS motion controls work effortlessly and just like Journey there’s no tutorial or hand-holding to speak of. Both leave you to discover things of your own accord, and are better experiences for it. Perhaps to compensate for their shortness, Flower and Journey have collectables to find that are so cunningly hidden – particularly in Flower – that chances are you’ll miss most of on your first play. 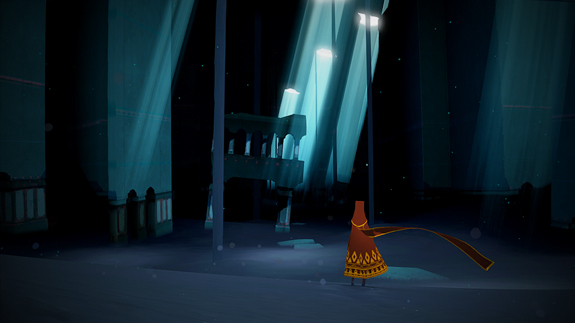 Journey also has a Trophy that’s gained by taking a second adventure a week after the first, thus giving further incentive to return. And so we’re left with flOw, a curious little oddity which entails guiding a deep-sea creature through various stages of evolution. It was originally intended to be a PS3 launch title and was available as a free browser game before even that. Despite its age it still manages to impress due to some subtle use of motion and object blurring. We were quick to notice though that the motion controls feel a little slack when compared to Flower, but given that it was the developer’s first PS3 title this is somewhat understandable. There’s no tutorial or explanation for this one either and there is a reason for this – when it was a browser game it was used as an experiment to monitor people’s playing habits. There we were swimming around gobbling up everything insight, only to then realise it’s possible to finish the game without eating a single other creature. This moral choice – for want of a better phrase – is pleasing, but flOw is ultimately a bit too simplistic to hold any lasting appeal. 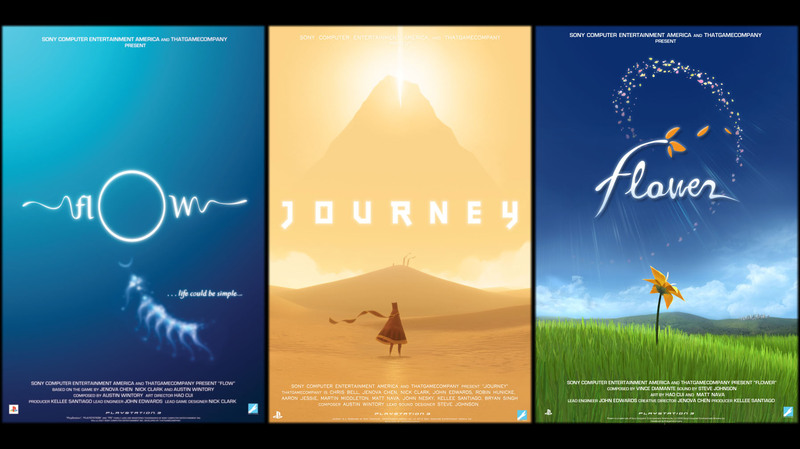 When viewed as a whole Journey Collector’s Edition feels like a labour of love – a physical love-letter to the fans that the developer has amassed over the years, if you will. Newcomers to all three in particular are in for an exceptional treat.